Question 2. If the primary root bridge experiences a power loss, which switch takes over? Question 4. If primary and secondary root switches with priority 16384 both experience catastrophic losses, which tertiary switch can take over? Question 5. Which spanning-tree protocol rides on top of another spanning-tree protocol? Question 6. Which IEEE standard does PVST+ use to tunnel information? Question 7. 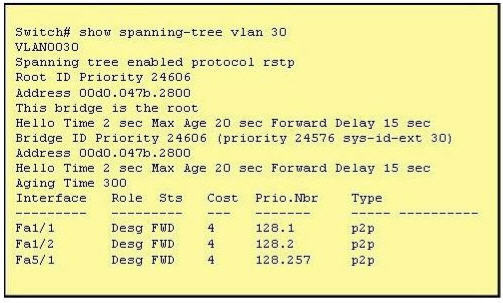 Which process is associated with spanning-tree convergence? Question 8. Which option describes how a switch in rapid PVST+ mode responds to a topology change? A. All ports will be in a state of discarding, learning or forwarding. F. The switch must be the root bridge for all VLANs on this switch. Question 11. When an interface is configured with PortFast BPDU guard, how does the interface respond when it receives a BPDU? B. It goes into an errdisable state. C. It goes into a down/down state. D. It becomes the root bridge for the configured VLAN. Question 12. 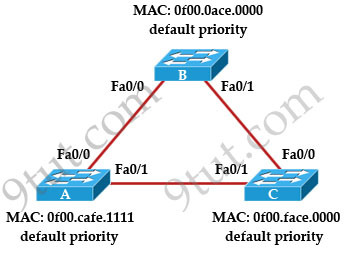 Which spanning-tree feature places a port immediately into a forwarding stated?